NOTE: The Photo Organizer product has been discontinued. If you were using this product, please try to find other products that can do this for you. Photo Organizer v1.3 is the ideal photo folder organizer! The Photo Organizer product has now been discontinued. If you were using this product, please try to find other products that can do this for you. Ever been in a situation where you have collected tons of jpeg image files (photos) and do not have the time to go through and sort them? Then Photo Organizer is for you! To uninstall, uninstall the program via the Windows Control Panel. This free version is for personal, non-commercial use only. Photo Organizer sorts your pictures based on when they were taken by you into events even if you previously placed them into one large folder. For example, let's say this weekend you take photos at a wedding. You do not transfer it to your computer just yet. The next weekend, you go hiking and take photos. When you get back, you then transfer the images to your computer. When you do so they usually end up in one big folder, say "Wedding and Hike". NOTE: Even if you use a program like Picasa, Picasa will simply ask you for a name when you transfer them from the camera. It then places the photos into one folder, which is still undesireable. Instead of the images being in one big folder, Photo Organizer will automatically arrange them for you into two events -- one for the first weekend and the second for the second weekend. And it will automatically put them in two separate folders on your computer automatically. It does this by recognizing the gap between the two events, the time duration of which is configurable. Besides, the pictures can be anywhere on your system. Photo Organizer will find, sort through the list and place them into structured folders. 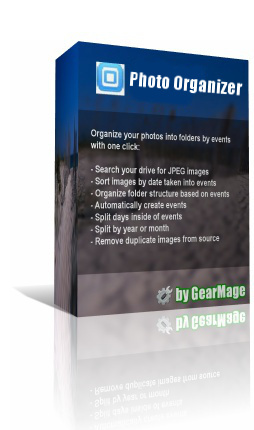 Photo Event Organizer will automatically find and sort your pictures into events and separate folders. Even if they exist in one single monolothic folder or scattered over your hard drive in many different folders. 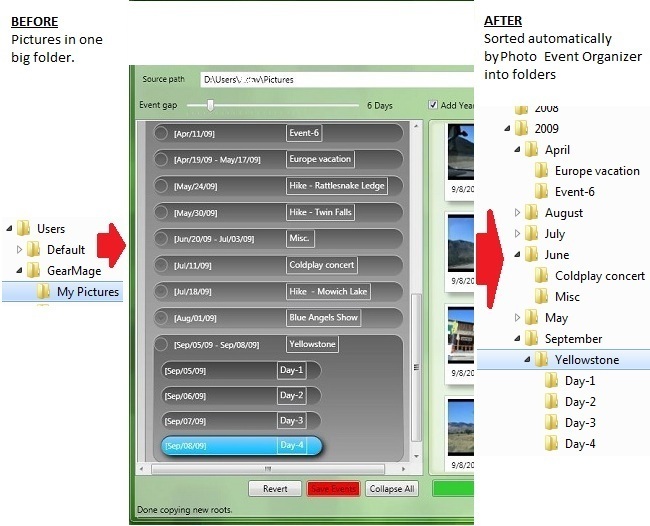 Photo Organizer consolidates duplicate images if you have many on your system as well. You can also choose whether the folder structure should contain the year and/or the month. Furthermore, Photo Organizer also splits each event into days for easy management. Picasa does not recognize events and therefore Photo Organizer can be used in conjuction with Picasa to better sort your photos. Moreover, if you use an XBox 360 or a media device to view your photos on your TV, it would be a lot easier to view it from a sorted collection of folders. Get Photo Organizer v1.3 today!